This week’s selection features Leiden Observatory, the oldest university observatory in the world. 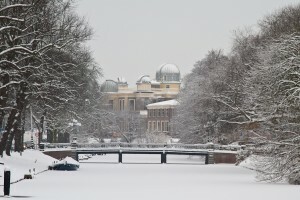 The observatory was established in the Academy Building of the Leiden University on Rapenburg Gracht (Canal) in 1633. The “new” observatory (the two domes at the left), now called the Old Observatory, was built next to the Witte Singel (White Canal) in 1860. The photo above was taken from the Witte Singel/Zoeterwoudsesingel bridge a year ago, on December 21, 2010, to mark the shortest day of the year in the Northern Hemisphere. Happy Winter Solstice!